Obituary for Bernice Elizabeth Kusnerak | Langeland Family Funeral Homes, Inc.
Bernice Elizabeth Salvaggio Kusnerak, age 100, passed away peacefully on Monday March 5, 2018. She was born on June15, 1917 in Kalamazoo, MI the daughter of John and Elizabeth (Culluffo) Salvaggio. During WWII, Bernice moved to California to work in the defense production plants. She settled in California until 2005 when she returned to Kalamazoo to be closer to her brothers and their families. Bernice loved music and enjoyed dancing to Big Band and Swing until well into her nineties. On November 29, 1950 Bernice married Steve "Barney" Kusnerak who preceded her in death in 1983. Bernice was also preceded in death by her parents and three brothers, Joe, Frank and Tony Salvaggio. Surviving are her brother, John (Jackie) Salvaggio of Portage and several nieces and nephews. 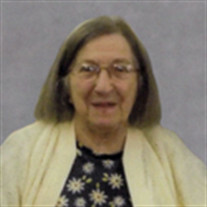 Bernice's family will receive guests beginning at 1PM and a memorial service will begin at 2PM on Thursday, March 15th at Langeland Family Funeral Homes, Portage Chapel, 411 E. Centre Ave. Pastor Clayton Smith of First Reformed Church of Portage will officiate. Private inurnment services will be held. In lieu of flowers memorials may be directed to the charity of one's choice.